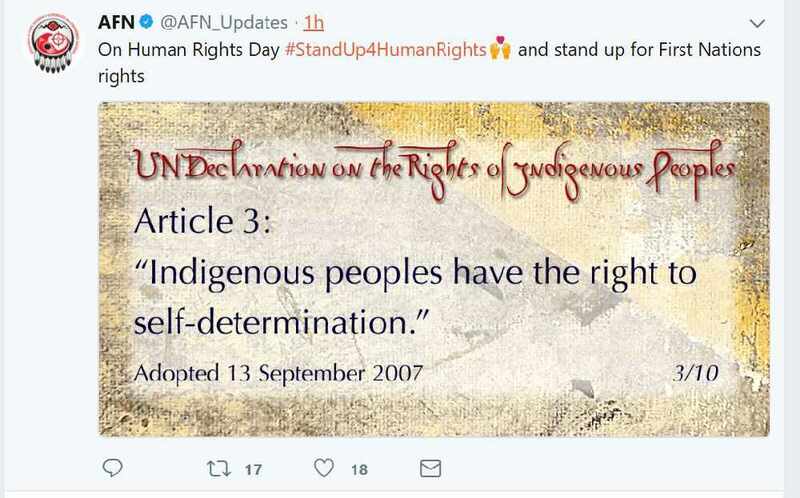 The Assembly of First Nation has taken the opportunity today—Human Rights Day—to remind its social media followers that Article 3 of the United Nations Declaration on the Rights of Indigenous Peoples states that Indigenous Peoples have the right to self-determination. The first of such hard questions may be how Indigenous peoples will organize into the future, she said. This statement comes on the heels of those made by former prime minister Paul Martin and former Ontario premier Bob Rae during a presentation Nov. 27 at the Nation-to Nation National Summit also in Ottawa. Martin said Indigenous peoples had a responsibility to determine how many nations there are. “I know there’s a huge debate of the number,” he said. Is it 58 as the National Chief Perry Bellegarde told the summit gathering, or 85 or 633 nations across the country? Rae said one of the worst things that the Indian Act has done was to confuse tiny units with the term ‘nation’ in the nation to nation relationship. Wilson-Raybould told the chiefs that the Indian Act and the imposition of band councils has “impoverished the notion of governance” and that must be addressed. Minister of Crown-Indigenous Relations and Northern Affairs Carolyn Bennett also talked about her department’s focus on “reconstituting nations” to accelerate progress towards self-determination. At the AFN special assembly Bennett quoted from Volume II of the 20-year-old Royal Commission on Aboriginal Peoples report with a statement from Regina Crowchild, who at the time was president of the Indian Association of Alberta. Much of Wilson-Raybould’s speech to the chiefs focused on the development of the “Recognition of Rights Framework”. “To reach a future where self-determination and self-government are fully respected, it means we have to remove the structures and restrictions of colonialism and embrace and encourage a reality where nations … are reconstituting, rebuilding and thriving,” she said. The framework needs to implement section 35 rights as a full box of rights and be aligned with and implement the UN Declaration on the Rights of Indigenous Peoples while not interfering with self-government or self-determination, Wilson-Raybould explained. Such a framework has never been attempted before, she said. December 10 annually is Human Rights Day, and today the United Nations kicked off a year-long campaign to mark the upcoming 70th anniversary of the Universal Declaration of Human Rights. It was signed in 1948 by the United Nations General Assembly.